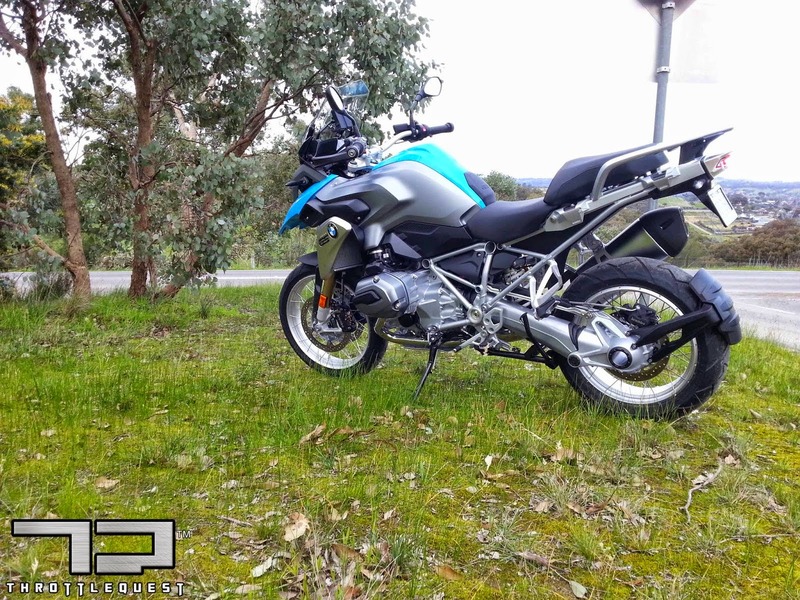 BMW 1200GS – Is this the Bear Grylls of motorcycles? BMW has made some great cars and iconic motorcycles in the past but this last decade they've replaced engineering with electronics, and while people argue from both forts I personally prefer the hoover dam to an iPhone and don't believe driver aids can compensate for engineering brilliance and for that reason I don't think they'll make a better driver's car than a manual E46 M3 from the early 2000s. And then their other great sin lately is their attempt to build the perfect vehicle. I don't know what the X6 or the 5 Series GT is meant to be but mixing every variant on the market doesn't equate to perfection, it's quite the opposite really, they're cars that do nothing right except telling people that you're desperate to make a statement. It's a bit like the perfect food – there is none and if you had to cook up roast lamb with chocolate sauce & cake batter you'll come up with something that makes you spew. 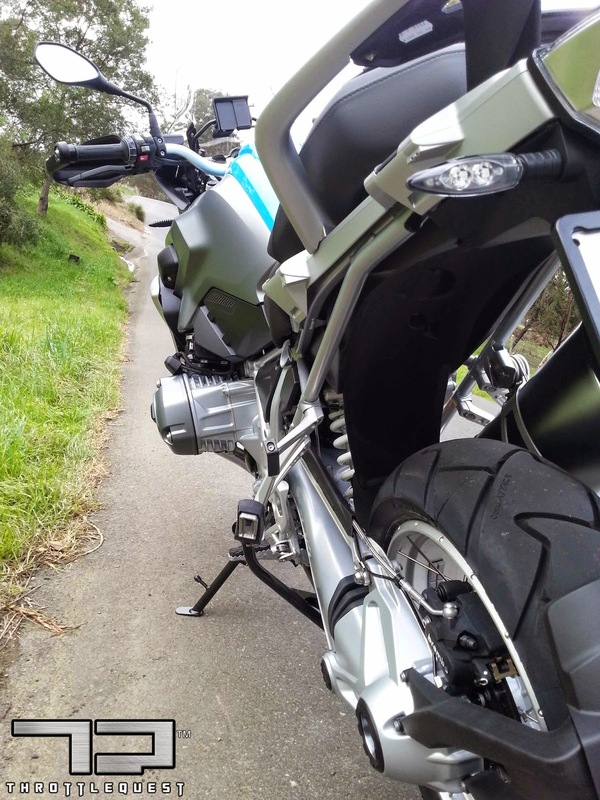 Now I'll quit rambling because we're not talking cars, it's about BMW motorcycles. Although their stable looks pretty interesting from the showroom window I'm slightly concerned that they're targeting middle aged clean shaven, tweed wearing gentlemen who want a motorcycle to do everything by flicking a switch. But let's not forget their legendary touring heritage, there are BMW riders all over the world who swear by their boxer twins and use them for what motorcycles are build for – Riding. You'll rarely see one of these Bavarian steeds studded with Swyarovski crystals and dipped in bee's wax or a thug riding an R1200 in a sleeveless leather vest with Hell's Angels patches. BMW bikes aren't built for posers! 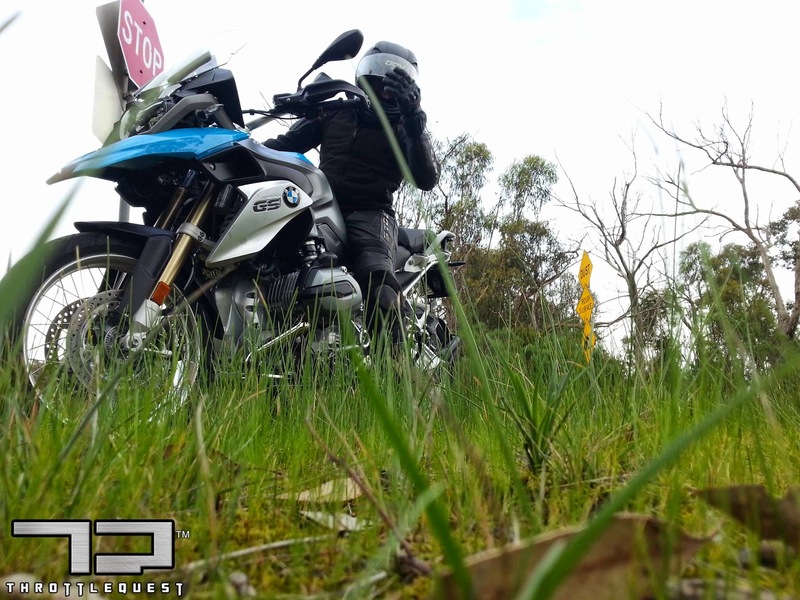 And the legendary GS leads the pack with bikes that redefined motorcycling by creating the Adventure Tourer, the most popular segment of two wheels sold here in Australia. And quite rightly so because there's no better way to experience freedom than a long hard ride through the outback. I've had a soft spot for the mighty GS for years and have always dreamt of owning one but I'm somehow more attracted to going fast on the pavement on two wheels while tearing up the tracks with the diesel torque of a large 4WD. 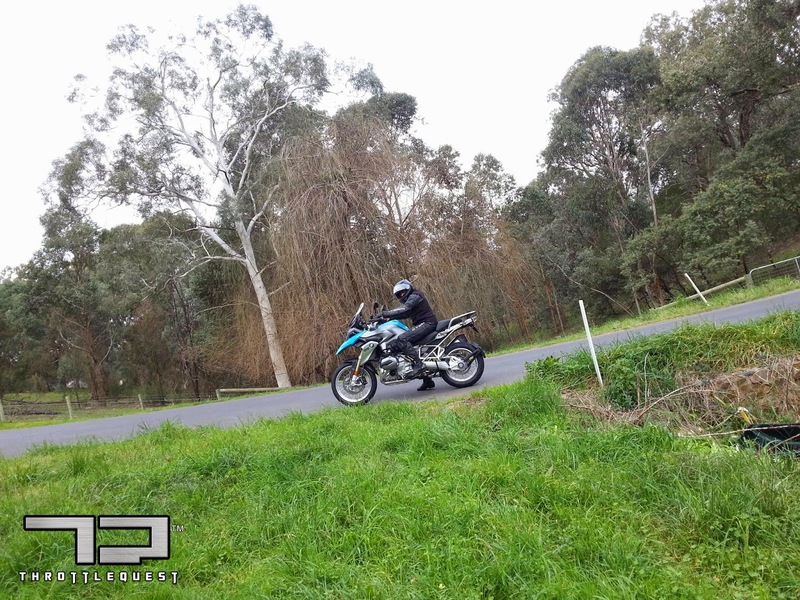 But when someone made me an offer on my bike it got me thinking – would the 4WD on two wheels tick all the boxes for me? So without further ado, this is what I thought of it. The bike is BIG and it dwarfs little me but when you sit on it man & machine fit together like the last pieces in a jigsaw puzzle. I didn't have any trouble wheeling it out of the shop or negotiating the tight parking lot. Ergonomically the bike is great and perfect for something that would ride across a continent in one stint. It scores high in the looks department with muscular lines and exposed tubular frame not having to be hidden by plastic fairings. In short it didn't look like a try hard male model, no need to get into detail here because I doubt anyone who buys one would care about appearance, theirs or the bike's. The display is clean, uncluttered and can be seen in bright sunlight. Gear indicator is the most obvious information followed by the odometer & engine temperature. 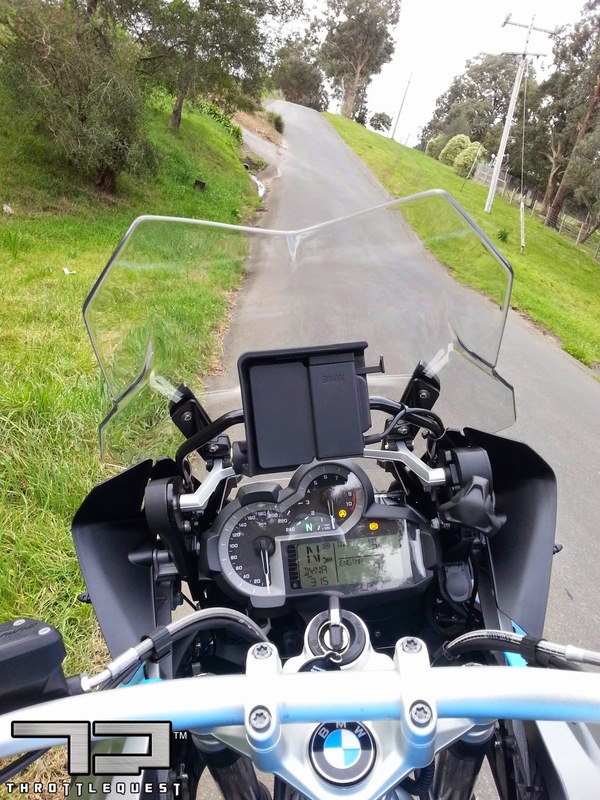 I would've preferred a bigger speedo & tachometer instead of a computer screen but I guess all those settings need to be displayed somewhere. I loved the switch gear, they felt very German and had a click to them so you know you meddled with something even through you're winter gloves. There are four riding modes – Rain, Street, Dynamic & Enduro. And then you could play with ABS & traction control too and as if that wasn't enough you had the option of adjusting the suspension from soft to medium to hard. Toggling between the settings weren't complicated like the KTMs but I didn't bother having much of a play because I wanted to ride. The seat is supposed to be slightly thinner than it's predecessor but comfortable none the less, I believe it's height & tilt adjustable just in case the 20,000k journey is wearing one corner of you're backside. Heated grips and cruise control come standard and both were east to operate and worked like they should. The bike I was riding was the base model and I reckon it was fully loaded but it gets better. There's an Adventure model that comes with metal framework for protection & luggage, spotlights, bigger tank & off­road tyres. I would save the extra $6000 and modify the base model myself. And what an engine it was. Almost completely redesigned last year, or so they say which I find hard to believe because it has the same bore & stroke. But either way it was a masterpiece. It's now partially water cooled and makes around 125 horsepower. Twist the wrist and you get to see sky for a little while and that wasn't even being nasty to the clutch. With the long stroke boxer twin all the torque was down low where you needed it. With some of the new bikes and their race to make the magical 200 horsepower figure they've sacrificed low end grunt for numbers ..cough #@...! zx14r & panigale.... but this no nonsense 1200 was built for riding, not bragging. After riding a hypersport you rarely jump on another bike and call it powerful especially if it's not a sportsbike but this machine sure made me grin inside my helmet - 100 in 3.6 seconds makes a track going Lamborghini look slow. And the power was effortless, it didn't vibrate, kick or scream, all that changed was the needle and the lampposts began flying past you faster. And when you came to a stop it idled with that true boxer sideways vibration, which was the only annoying part of the experience. The Gearbox has always been BMW's Achilles heel and it's still notchy but it's a big improvement from the previous model's dry clutch. It also sports a slipper clutch which stops the rear wheel from locking up when downshifting, it's a simple contraption that makes any powerful bike a lot nicer ride. I'd like to compare the ride to sitting on a warthog, it's big and fast and charges through or over anything without much effort. On the road it was good but not amazing, power was down low where you used it most and that encouraged you to have a play but I felt it was more suited to getting you to you're destination than letting you enjoy the ride. It handled really well for an old­ man adventure bike but I didn't push it because it had a set of 5 minute old tyres. One thing I hated about the bike was the plastic screen, while it did a great job at wind protection when you duck down and looked through it, it changed the perspective of your vision, kinda like wearing granddad's thick bifocal spectacles while riding a motorcycle at a 130k around corners. Off­road the beast wasn't bad either, it ploughed through/over everything you pointed it at with zero effort and the bike just bounced off undulations and potholes managing to compose itself magically, making you think you did it all yourself. However, I don't know if it's the seating position or the engine but the KTM Adventure is more fun on dirt than the GS, maybe because the Adventures are really an oversize dirtbike, most KTMs are. 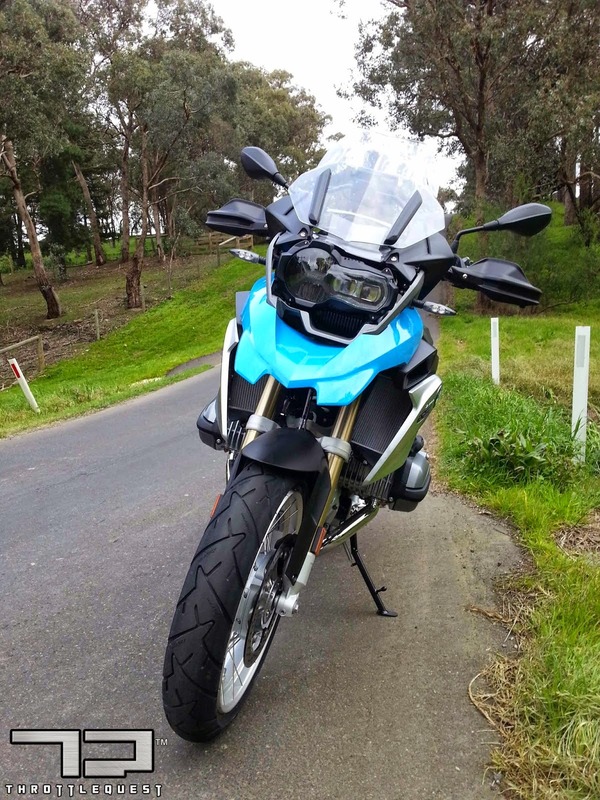 Special mention to the infinitely customisable electronic suspension adjustment (ESA) on the new GS, meant you could turn off ABS & traction control and selecting enduro mode eased the throttle response and softened the damping. ESA is pretty trick and BMW likes to tell you that it's like having a technician from Ohlins with you on the ride but I'm not completely sold on the idea and for now prefer the fully adjustable conventional suspension just because you can get more out of it. For a dirt track it was soft enough & perfectly damped but on the road 'sport/hard' wasn't hard. And unlike screws & knobs it's another complicated system that can fail and cost bags of money to diagnose & fix. I've heard a faulty sensor or actuator on the damper can send ESA into 'limp home' mode and stiffen up everything making the bike almost un-rideable. I haven't experienced it but last week I had a Mercedes S class at work that turned the shock ­absorbers off because of a loose connection on one sensor. The dealership didn't deny these problems but assured me that it's covered by the two year warranty...but what happens if it fails in five years?? And if it fails in the middle of the Sahara you'll star in an episode of I shouldn't be alive. All the winging aside, most riders love ESA on their bikes and I have to give them credit for letting the rider control the suspension, traction control & ABS. 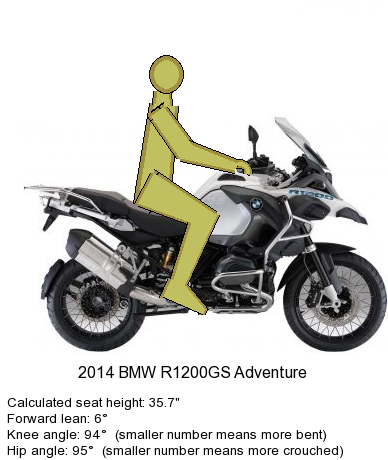 If numbers mean anything the R1200 GS has set every chart on fire from it's rebirth in 2004. And unlike movie sequels this motorcycle only got better from there. It always lead the Adventure Tourer market by miles despite almost every other manufacturer's effort to dethrone the king, so by the books this is the bees knees of motorbikes. People love the GS because it's a Swiss army knife of motorcycles, but me – I like using a real saw to cut wood and a real toothpick after I've eaten steak even if it's having different tools to do different jobs. Riding home that evening on my ZX14r reminded me why I love my bike – even if it can only do one thing it does it really really well. 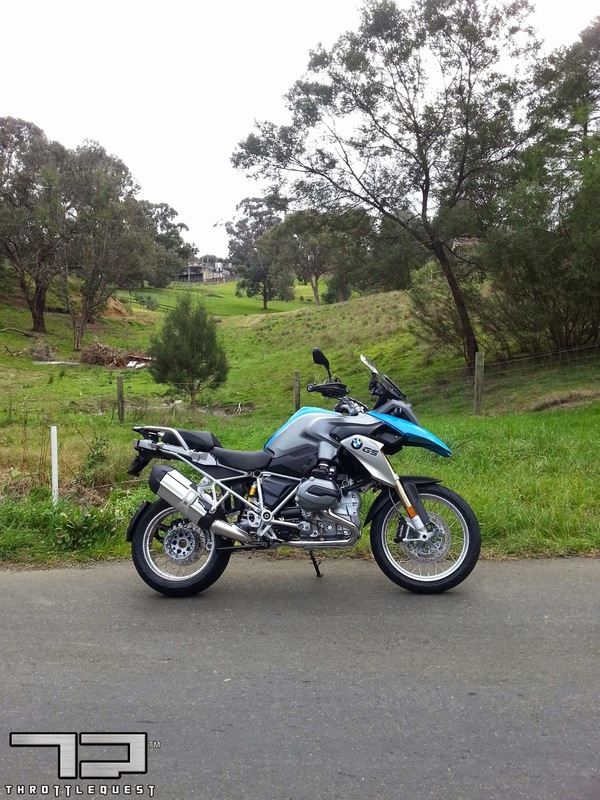 The 1200 GS does EVERYTHING but it doesn't excel in anything except for eating miles. I'd hate to call it dull because it is a brilliant bike so maybe 'easy' is a better word but I don't always like easy, I sometimes like the feeling of having a fight and winning, with a few power-slides thrown in for good measure. It's like fishing for giant tuna with a rod & reel, there's easer ways to do it but nothing more satisfying than reeling in a 100 pounder after a two hour fight. Riding the GS is like being served a slice of that tuna in a fancy Michelin starred restaurant – same end result but different ways of getting there. For the adventure riding I'd like to do I'll need a bike that I'm not scared of dropping, drowning or dirtying. Something simple that can be fixed with a spanner & a stone and primarily something light. 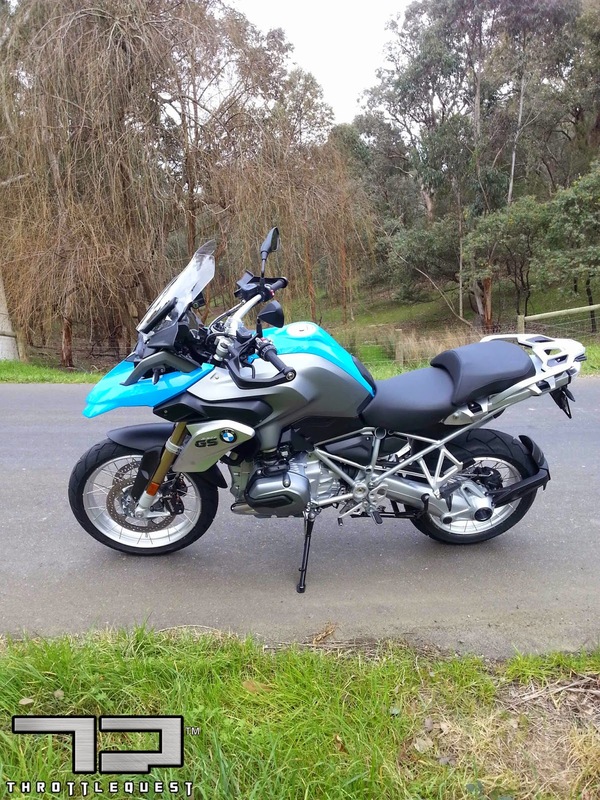 But just because I don't want it doesn't mean the BMW R1200GS isn't a great bike, maybe it's too good for me like champagne and caviar but someday when I want to ride around the world in 80 days I know what I'm going to do it on.